Collectorz.com collection database Software - Catalog your collection in no time. Catalog your movies, books, music, comic books and video games. Just enter titles or scan barcodes for automatic item details and cover images. 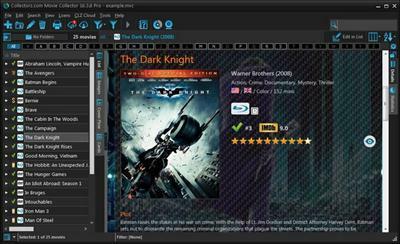 Catalog your DVD and Blu-Ray movies in no time at all. Just enter titles or scan barcodes for automatic cast, crew & cover art. Automatically download cast, crew, cover art, movie Descriptions, episode lists and more. Just enter the movie title or scan the barcode on the box. Browse your movie database in cover flow. Sort lists any way you want. Find movies quickly and easily. Keep track of your collection and wish list. Never buy dupes again. Export your movie collection and wish list to the CLZ Movies app, available for iPhone/iPad & Android. Upload your database online, for easy access & sharing with friends. Catalog your book collection in no time at all. Just enter or scan ISBNs for automatic book data & cover art. Automatically download full book details and cover images. Just enter author and title, enter ISBNs or scan ISBN barcodes. Scan your hard-disk for ebook files. Browse your book database in cover flow. Sort lists any way you want. Find books quickly and easily. Keep track of your database and wish list. Never buy dupes again. Export your book database and wish list to the CLZ Books app, available for iPhone/iPad & Android. Upload your database online, for easy access & sharing with friends. Organize your music collection (CDs, vinyl and music files) in no time at all. Automatically download album information, track lists and cover art. Automatically download album details, track lists and cover art. Just insert CDs, enter artists & titles or scan the CD case barcodes. Scan your hard-disk for music files. Browse your music database in cover flow. Sort lists any way you want. Find music quickly and easily. Keep track of your collection and wish list. Never buy dupes again. Export your music collection and wish list to the CLZ Music app, available for iPhone/iPad & Android. Upload your database online, for easy access & sharing with friends. Catalog your comic book collection in no time at all. Just enter titles or scan barcodes for automatic issue data & cover art. Automatically download full issue data, like creator and character lists, sollicitations, plus cover art. Just enter the series titles or scan comic book barcodes. Browse your comic database in cover flow. Sort lists any way you want. Find issues quickly and easily. Keep track of your collection and wish list. Never buy dupes again. Export your comic database and wish list to the CLZ Comics app, available for iPhone/iPad & Android. Upload your database online, for easy access & sharing with friends. Catalog your game collection in no time at all. Just enter titles or scan barcodes for automatic game data & cover art. Automatically download game information (description, publisher, developer, etc...) and cover images. Just enter the game title or scan the barcode on the box. Browse your game database in cover flow. Sort lists any way you want. Find games quickly and easily. Keep track of your database and wish list. Never buy dupes again. Export your game database and wish list to the CLZ Games app, available for iPhone/iPad & Android. Upload your database online, for easy access & sharing with friends.